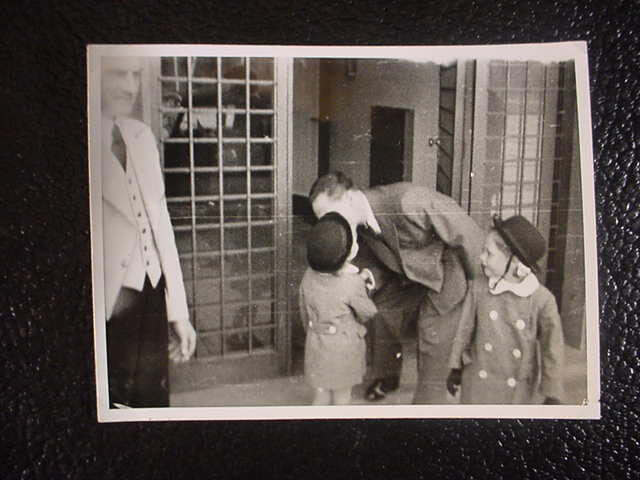 DESCRIPTION: This is a charming picture of Dr. Goebbels saying goodbye to his little daughters as he goes off on one of his many trips speaking on behalf of the NSDAP. 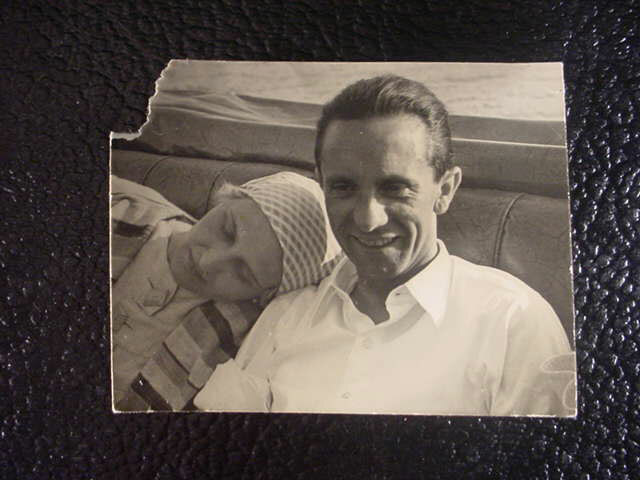 DESCRIPTION: This is a small natural photo of Dr. Goebbels and Magda taken by a beach. Maybe the Konigsee it is a truly charming picture of the little Dr. and Mrs. Goebbels in happier times. It measures 2 ¼ x 3. The left corner is chipped probably from pulling it out of an album. Small but rare and great. DESCRIPTION: This is a great photo of the Fuhrer with one of Paul and Magda Goebbels’ children in a beach side depiction. We believe it to be an actual photo printed on postcard stock as was the custom. It has the Heinrich Hoffmann imprint on the back and numbers that indicate that this may indeed be an original. Good condition. DESCRIPTION: This picture is candid and was never published. 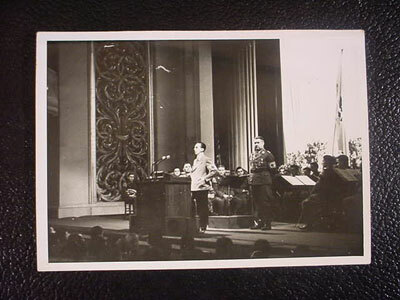 Measures 5 x 7 and is probably a press picture that was discarded due to in-perfect exposure. 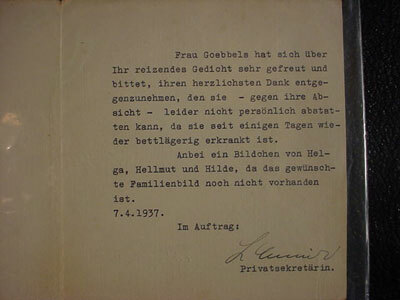 It has no official stamp on the back indicating (non published). Rare! DESCRIPTION:This is a 3 ½ x 5 ½ photo of Dr. Goebbels being greeted by various party functionaries as he arrives in Erastruck on July 18, 1938. It is a nice clear photo and we do believe it is an original photo developed and printed on postcard stock. Very nice and historically important. 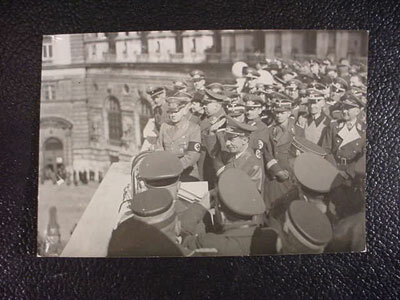 DESCRIPTION: This photo is of the Reischs Propaganda Ministor Goebbels passing by as he reviews the men of the elite Vienna SA Guard Regiment. 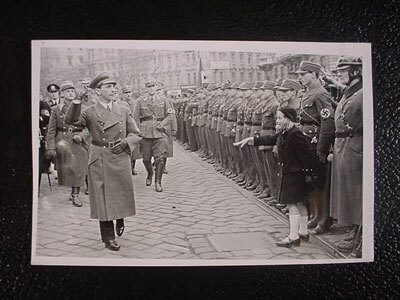 The picture is great but also prodigiously charming as a little Aryan girl breaks through the ranks to personally great “Unser Joseph” (Our Joseph) He was greatly admired by the Austrian people. The picture measures 4 /12 x 7 and is in beautiful glossy photo finish. The photographer has his stamp on the back from his gallery in Vienna. 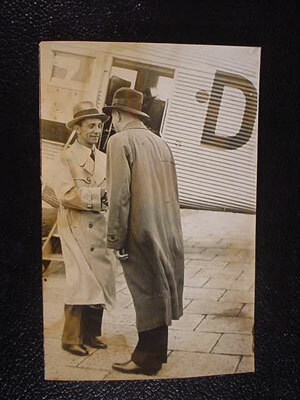 DESCRIPTION: Here is a rare (original) photo measuring 5 ½ x 8 ¼ of Dr. Goebbels as he emerges from a JU 52 Transport Plane and is greeted by an unknown personage (possibly is Burgemeister) This is a rare original picture. It has water stains that are only noticeable on close inspection. On the back it has the stamp identifying the photo studio that took the picture in Hamburg. Quite rare and we doubt it was ever published. 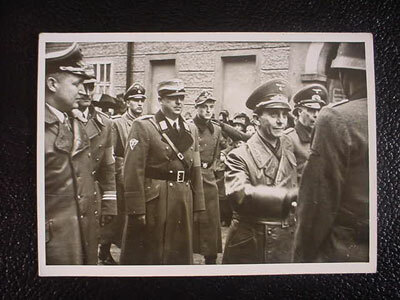 DESCRIPTION: This is a nice clear photo of Dr. Goebbels as he is greeted by various members of the NSDAP and political leader core somewhere in Germany. 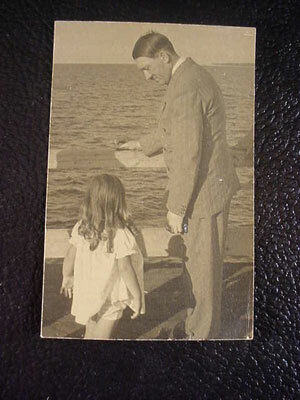 DESCRIPTION: This is an important original picture of historic value. 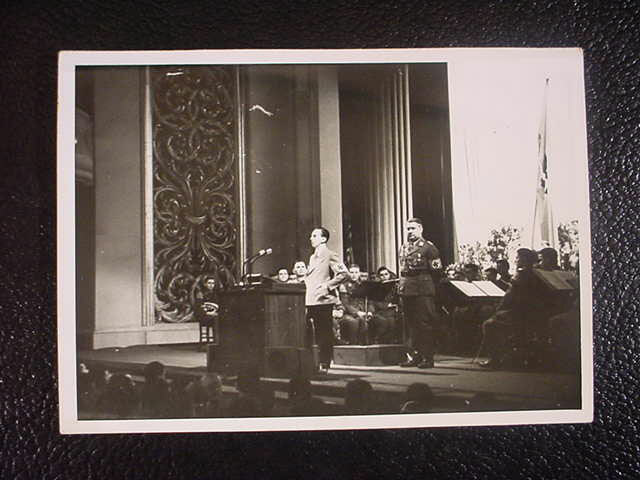 It depicts Dr. Goebbels as he steps to the podium to deliver the Austrian Ansuluss Speech. He is surrounded by various German and Austrian officials and political leaders plus military officers from various branches of the Wehrmacht. This is an important picture 100% original. The picture is stamped on the back with the identification that it is from the photographer Wienbud (photo for press and propaganda) It measures 7 x 5 and it’s clarity is outstanding. 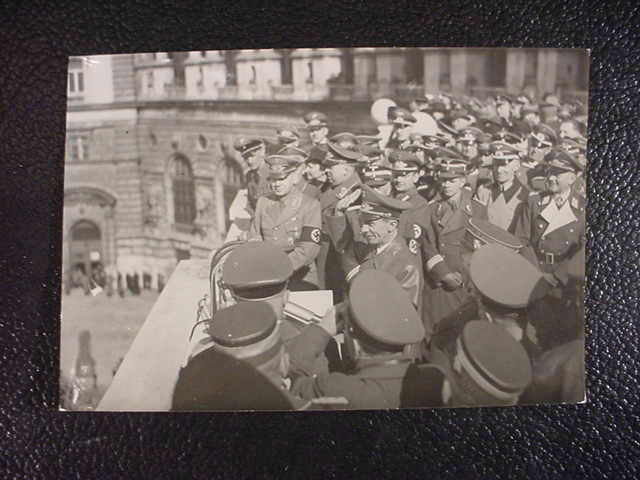 DESCRIPTION: This is a photo that was an A.G. Schostal produced photo that was an official press release. It measures 6 ½ x 9. 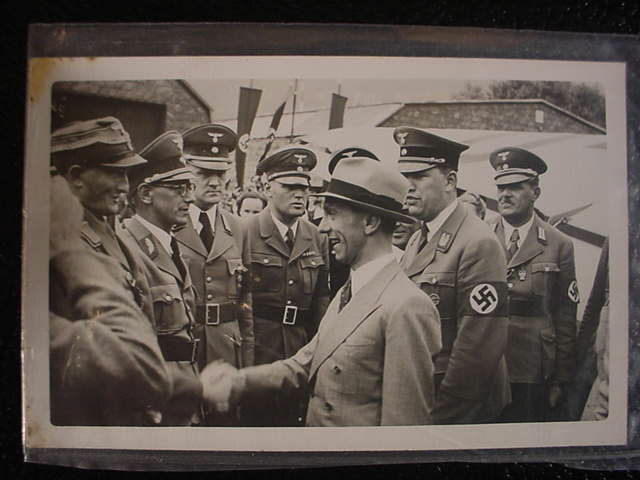 It is a picture of Dr. Goebbels with a delegation of N.S. 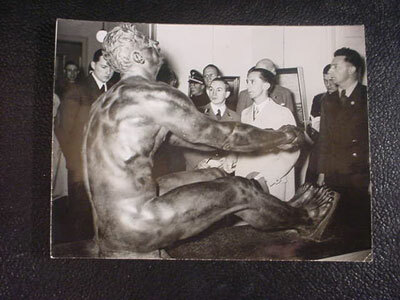 officials visiting the Berlin Museum of Art. They view a magnificent statue of a muscular giant of a man (a study in human motion) as personified in N.S. and especially fascist art. 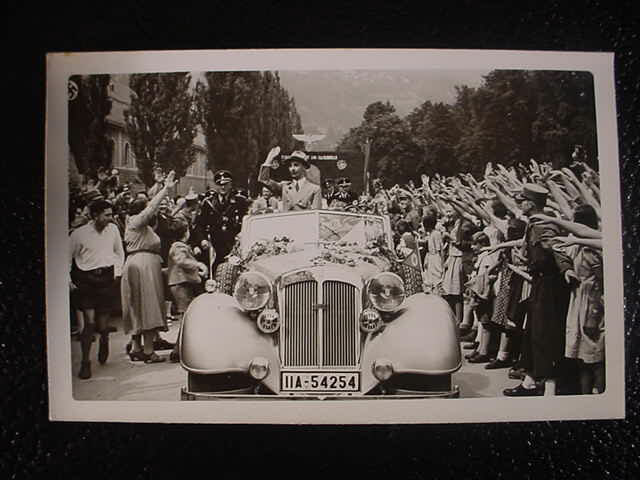 DESCRIPTION: This is another view of the minister Goebbels as he triumphantly enters Austria through the “Tirolianland”. 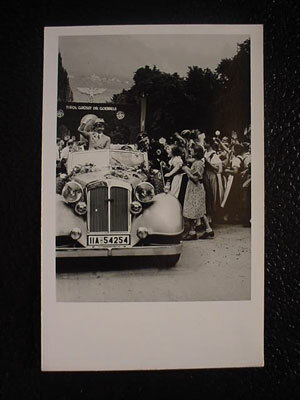 This picture is 3 ½ x 5 ½ in size and is a nice clear picture of the little doctor with the exuberant crowns greeting him. A beautiful clear photo (original). 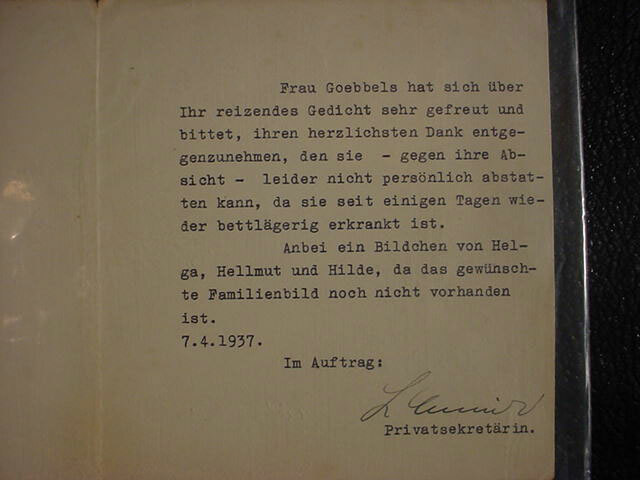 DESCRIPTION: This 70 year old card would have been sent by Dr. Goebbels private secretary who sends friendly greetings to a well wisher who evidently sent a congratulations card to Paul and Magda for the birth of their daughter “Holde”. It was made to be sent from Berlin in February 1937. All the children’s names started with an “H”. 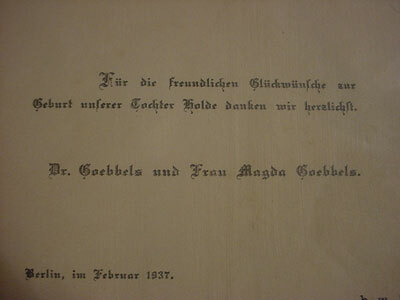 Hellmut, Helga, Hilde are mentioned in a note from the secretary who evidentially would enclose a picture of 3 of the children with this greeting. The signature is printed, not hand signed.